Well, here we are—shockingly—in December. ‘Tis the season to be harried, so for everyone’s benefit (including my own), this post will be short and sweet. 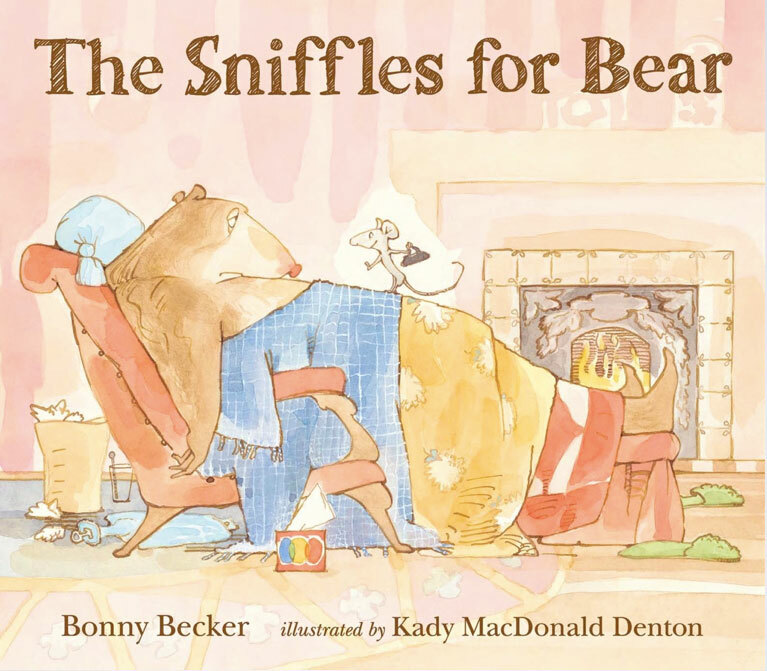 Read Bonny Becker’s Bear & Mouse books. And then there are Kady MacDonald Denton’s charming illustrations, which perfectly animate these characters, add humor, and place them in irresistible settings that invite you to pull up a soft and well-upholstered chair . . .
Or pull on your snow boots and join in the fun. 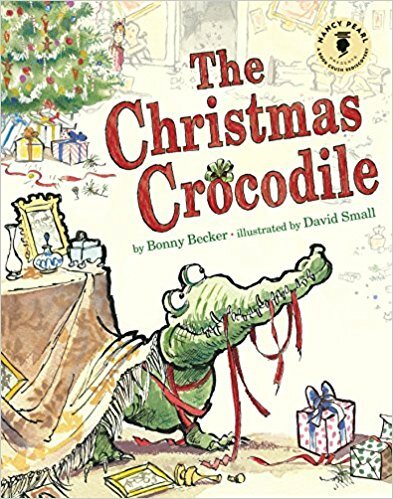 For the record, Bonny Becker also wrote one of our family’s favorite holiday books, The Christmas Crocodile, illustrated by David Small. It has little to do with Christmas (aside from all the presents the crocodile eats), but plenty to do with wacky characters, a fabulous voice, loads of slapstick humor, wonderful illustrations, and a classic “Ha!” ending. (The book went out of print, but was reissued last year by Amazon’s Two Lions imprint as a “Nancy Pearl Book Crush Rediscovery,” a program that’s been discontinued, sadly). So happy holidays, all, and happy reading. See you next year! P.S. 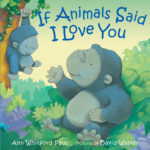 The winner of Ann Whitford Paul’s If Animal’s Said I Love You from my last post is David McMullin. Congratulations, David! 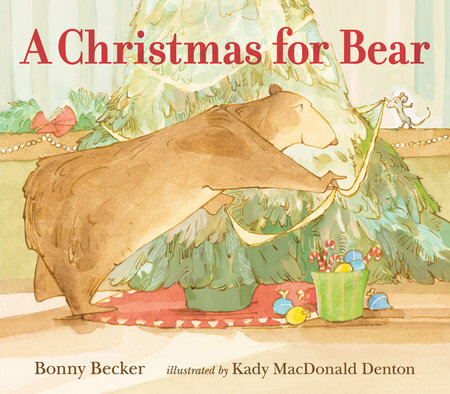 A Christmas for Bear, Bonny Becker, David Small, Kady MacDonald Denton, The Christmas Crocodile, The Sniffles for Bear. Bookmark. Thanks for sharing! I’ve never heard of this author or her books. So happy to introduce you, Tina! I bet you’ll love them. Let me know what you think! I’ve been loving Bonny Becker’s bear and mouse stories for years! And I agree – Kady MacDonald Denton’s illustrations are spot on! Yes, it’s a match made in heaven, isn’t it? Thanks, Lori! I just added some of her books to my library list. I look forward to seeing them. 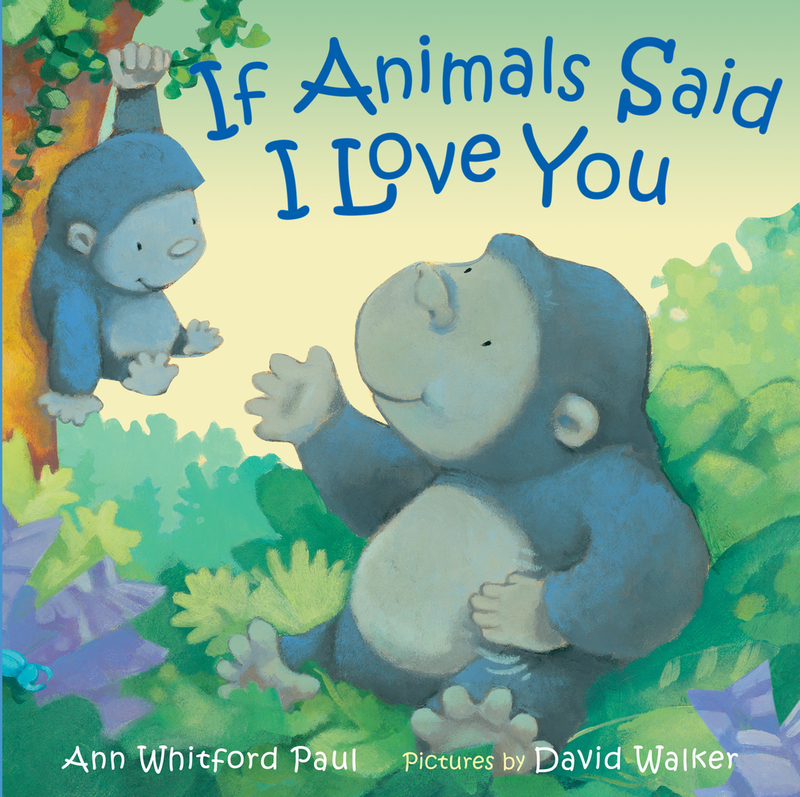 And I’m so happy to have won Ann’s wonderful book! I think you’ll really enjoy them, David. And congrats again! I’m so glad you featured this one. A couple of weeks ago, I picked A Christmas for Bear as my favorite new 2017 holiday book for a PB party I’m going to tomorrow. (We have to bring one favorite classic holiday title and a favorite pick from 2017.) At the same time, I read the reissue of the very fun The Christmas Crocodile. Christmas for Bear–the writing and the illustrations–is such a perfectly orchestrated mix of subtlety, surprise, predictability, quirkiness, charm, character, and love all mixed into a lyrical Christmas confection and baked to perfection. And it’s a fun read-aloud. Beautifully said, Colleen. I agree! They’re wonderful, aren’t they? Thanks, Angie! I’m so glad to be the matchmaker here. I bet you’ll love them! Happy holidays to you too, Maria! I love, love, LOVE everything about these books! From Bonny’s brilliant word choice, to Kady’s whimsical illustrations. I didn’t know about The Christmas Crocodile and am excited to look it up. Thanks, Linda! Aren’t they fabulous? I bet you’ll enjoy Crocodile too. It was so fun to read together when my son was small. Have a wonderful holiday, Jennifer! I didn’t know about A Christmas for Bear, I’ll track that one down pronto. The Bear and Mouse books are such a perfect pairing of text and illustration, what a cozy world! I agree, Susan. Each one is a gem. Happy holidays! Thank you, Linda, for reminding me of how much I love these books. It’s time to reread and type the texts. Mentor books, for sure! Wishing you a joyous holiday season. Thanks, Anne. Happy holidays to you. too!! I haven’t read the new Bear and Mouse book yet, but I hope to pick some up for Christmas gifts this week. 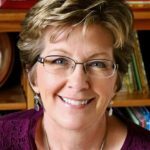 We were so lucky to have Bonnie come to Spokane a couple of years ago for a PB intensive. She’s such a great teacher! Thanks, Linda, Happy Holidays! Hi, Rachel! What a wonderful intensive that must have been! And, yes, the newest Bear & Mouse would make an excellent gift–just as charming and funny as the others. Happy holidays to you, too! Ahh . . . these books look delightful! They definitely are, Kathy. Happy holidays! 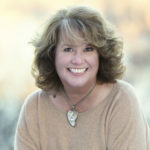 Thank you, Linda, for introducing me to Bonny’s books! They look scrumptious! They are, they are! Check them out, Mary! I just saw the action figure recently, Mary. It’s fabulous! And I got to meet Nancy too when she spoke at the Chapel Hill Library last month. Good idea to look up other books in the program. I need to do that as well! I find it impossible to read any of the books in this series without falling into very distinct accents for Bear and Mouse. So fun!. Bonny’s language is just delicious in each book.. I know what you mean, Jill. I do the same thing. I so love these books. I remember The Christmas Crocodile. I’m sorry to hear it’s out of print. Her new books look great. I’ll check them out. You can still buy the new Two Lions edition of the Christmas Crocodile, Cassie. Such a fun book! Bonny is a treasure. And a great teacher. If you ever have a chance to take a workshop with her, do it.